Chai teas are special black teas. There is no one "definition" really of a chai tea. True, in Chinese and in most of Asia actually, "Chai" means tea. However, when one thinks of Chai teas here in the USA, the first thing that comes to mind is "spicy." You see, the most common characteristic of a chai tea is that something spicy has been added to the tea, in particular cardamom. Common spices found in chai teas include black pepper, cinnamon, cardamom (pretty much a necessity for a chai tea), ginger, cloves, peppercorn, among other things. I personally love chai teas. The reason for this is because I love spicy things, and spicy teas are no exception to this. For this reason, there is quite a few chai tea reviews on this site. 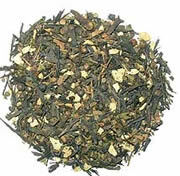 That all said, there are plenty of other teas in the world today that are spicy but are not chai teas. To find all the spicy teas I've reviews on this site, look in the Spicy Teas section. To read the full reviews of the various chai teas in this blog, simply click on any of the links below. Tazo Chai Organic Spiced Black Tea : A very tasty and spicy organic Chai Tea from Tazo. The perfect way to add spice to your life. Tazo Decaffeinated Chai Spiced Black Tea : An excellent chai spiced black tea, despite being decaffeinated. If you like spicy teas, you'll enjoy this one.